We’ve recently blogged about how ChromaGen Lenses are not in themselves a treatment for dyslexia. There have been many more disconcerting pieces in the news cropping up about the "effectiveness" of the lenses as a treatment for dyslexia, such as this one over at Fox News. It is important to note that while these glasses have been approved to aid in the treatment of visual problems, they are not approved by the FDA to treat dyslexia. Dyslexia in itself is not a vision problem, but rather a language-based problem that requires systemic language-based intervention. Although individuals with dyslexia may also have vision problems, one does not cause the other and treating vision issues with ChromaGen Lenses will not cure dyslexia. In case you missed it, read the IDA article which gives a deeper discussion of the research on vision and dyslexia. 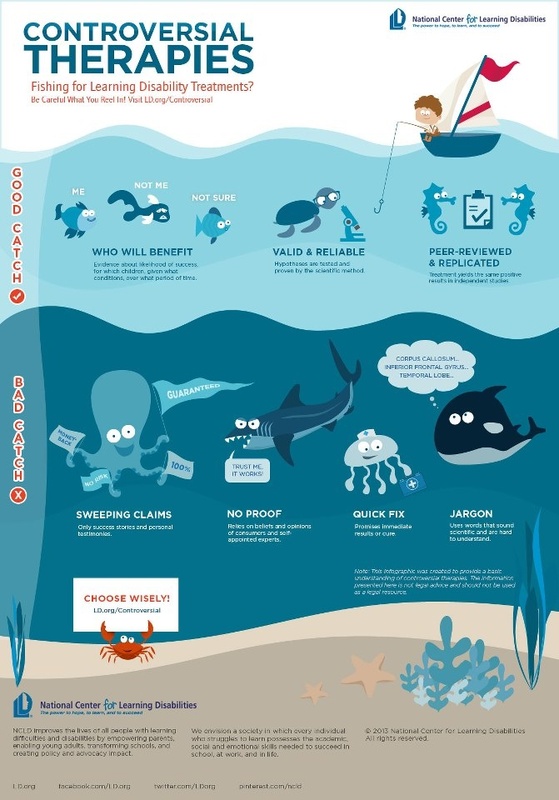 Also, be sure to take a look at this infographic to help you determine which therapies are good and which may be fishy!